Yes, Tullulah can be a sleepy little town. But no one sleeps through the night a violent thunderstorm knocks down a tree on Jane’s property—one that uncovers a pile of skeletal remains beneath. Thanks to her travels, Jane happens to know a bit about archaeology, and has friends in high places. So she invites an archaeological expert to come over for a look...only to find that things in Tullulah are not at all as they seem. 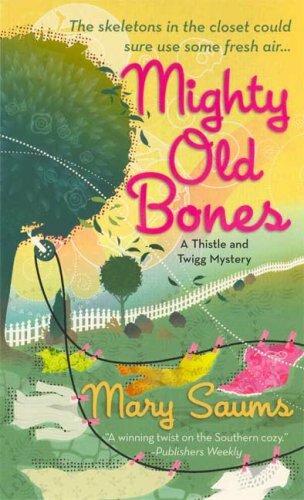 Now it's up to the town's superior senior sleuths Thistle and Twigg to dig up the truth. This is going into one of my virtual bookboxes. I did enjoy this and will look for the first in the series now. Here's a RABCK book from your wishlist. After you have read it, you can set it aside for my Box of Bones VBB. Enjoy! This was a great surprise! A wishlist book AND it qualifies for you next VBB, plus I've already read the first book in this series! Thank you so much for your generosity loveamystery!